If true, the Dodge Challenger SRT Demon may only have 50 horsepower more than the Hellcat. Dodge has been busy hyping up the Challenger SRT Demon to be a monstrous muscle car – and that’s saying something, considering it has the insane, tire-smoking Hellcat to live up to. So far, we know it will be a lightweight beast that can be customized for both the road and drag strip. Dodge is keeping quiet about the Demon’s power output, leaving us in suspense in the run-up to its reveal in April. However, Road and Track may have uncovered how many horses will be under the hood – and it’s underwhelming, to say the least. Accompanying this week’s Demon Crate press release was a photo of the Demon badge screwed onto the crate with the serial number of “0757”. Road and Track reckons this could represent the horsepower figure of the Demon – and they could be right. After all, Dodge revels in teasing us with cryptic clues that has fans meticulously scanning every photo to uncover new details. Even the license plate number shown in the drag-spec Demon photo is probably hinting at something. Backing up this theory, Dodge says that "nothing is a coincidence and everything means something." As it happens, Dodge did the same during the Challenger SRT Hellcat’s pre-reveal campaign. An interior image showed the radio tuned to frequency “70s on 7,” which of course turned out to be hinting at its 707-hp power output. 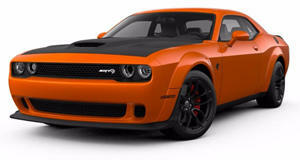 If true, the Demon’s 757 horsepower would mean it has 50 horsepower more than the Challenger SRT Hellcat. That would be disappointing, considering it was rumored to have as much as 800 – 900-hp. There’s another possible clue in the image, too. The “001122” VIN number could be pointing to the Demon’s torque in Nm, which translates to 827 lb-ft, up from the 650 lb-ft you get in the Hellcat. Suddenly, the Demon isn’t sounding like the mad monster we were hoping for.